There are fears in Collins’ camp that the real Jami-Lee Ross may be regaining control of his mind. National MP Judith Collins is said to be panicking after her mind lost all control of one of its host bodies in the late hours of this morning. The body, apparently accelerating its programming by several years, went on a 50-minute press conference rampage, accusing leader Simon Bridges of everything from election finance fraud to fabricating claims of sexual harassment. 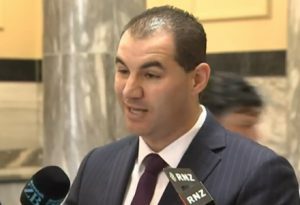 In the most extraordinary press conference in recent New Zealand political history, the body – which once belonged to Botany MP Jami-Lee Ross – took a blowtorch to the leadership of the National Party, who simultaneously voted to expel him. He claimed that Bridges had committed “significant crimes” and attempted to fabricate sexual harassment claims against him, even going so far as to hire real women to be involuntarily harrassed by him. Ross’ body is part of the Judith Collins Drone MP Programme, a project to utilise the formerly free minds of National Party MPs to exact her will upon her enemies. This isn’t the first time that one of Collins’ host bodies has gone rogue – early prototypes of the programme, Aaron Gilmore and Todd Barclay, also backfired in public – but neither of those incidents were anywhere near as destructive as this one is proving to be, and it may be just the beginning. Ross’ body continues to level accusations from his Twitter account, blaming Simon Bridges for the BP oil spill in the Gulf of Mexico, trapping 12 Thai boys in a cave for several weeks, and The Spinoff TV. The National leader continually emphasized the unanimous support of his caucus, multi-tasking as he frantically checked his phone while talking to journalists. “Sorry, the best chance we have of taking this party to victory in 2020. And as I’ve had the chance to hear from all 53 of them today, they all support me. So I repeat, I have the full, unequivocal support of 52 MPs, 51 National MPs. Judith Collins, meanwhile, has been trying desperately to regain control of Ross, and posted a series of bizarre tweets that may be attempts to activate his kill switch. Two other MPs that are part of the Collins Drone MP Programme, Simeon Brown and Chris Penk, have been recalled until the cause of Ross’ unravelling has been isolated. Despite Collins’ efforts, Ross is still alive, and in the last hour, put out a press release saying he had “forgot some stuff,” and is planning another press conference in 20 minutes.